I don't tweet. I don't even like to talk on a phone. I once stood behind a woman talking on her cell and here is what she said. "I am waiting on the bus." "I am getting on the bus." Thankful for me she moved to the back of the bus, still talking, and I was soon out of earshot. This conversation begs the question: Who was listening to her? Seriously. For every lame telephone call there is someone on the other end listening. Again I would ask, "Who is more pitiful?" the caller or the person who was listening to this woman for who knows how long. Surely that other person had something better to do. Fortunately on Twitter, you are allowed only 140 characters. They say some celebrities tweet two or three time a minute and millions of people wait to read them. "Went to the chicken house and let out the chickens." "Fixed the sink at the Post Office." I will stop as I am sure the scintillating nature of my tweets has left you overwhelmed with emotion. 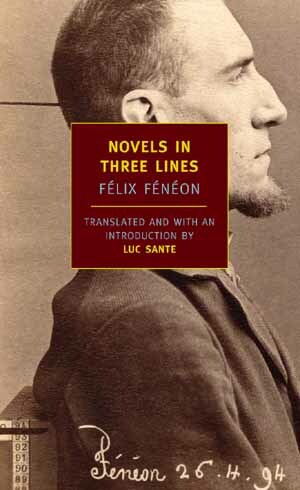 There is no way to stop Twitter, however, if you are enamored of this technology and want to excel in your 140 character endeavors, might I suggest reading Félix Fénéon's Novels In Three Lines. Fénéon was a clerk, editor, anarchist, critic and writer. His major work was recently published by the New York Review of Books. Félix Fénéon was employed by the Paris daily, Le Matin to write faits-divers, "sundry events" as Luc Sante translates it. they were a kind of newspaper filler. When these "fillers' were published they were entitled Nouvelles en trois lignes. It has been translated as novels in three lines, but more correctly it could be titled the news in three lines. “To die like Joan of Arc!” cried Terbaud from the top of a pyre made of his furniture. The firemen of Saint-Ouen stifled his ambition. During a scuffle in Grenoble, three demonstrators were arrested by the brigade, who were hissed by the crowd. Sand and only that was the content of two suspect packages that yesterday morning alarmed Saint-Germain-en-Laye. There are over a thousand of Fénéon's faits-divers in Novels In Three Lines. Tweet one to a friend. Brilliant. I should purchase this book for my kids to learn the art of getting to the point briefly. It always occurs should they require something; typically money! I do 'tweet' but don't really pay attention to what is being tweeted for more than a few minutes a week. I try to get it, but don't. I too have very little of worldly importance to tweet about. Mine would be, 'I scrubbed the toilet'; 'today I went to Walmart'. You get the jest of it! "Janine was texting as she drove 90 miles an hour down icy I-40. At least that is what the coroner thinks-".